The MC-21 increases the number of interchangeable lenses manufactured by Sigma that can be used with the L-Mount systems by 29, offering a total of 40 lens choices, including 11 DG Art primes with native L-mount. The Sigma MC-21 will start shipping in April and will be priced at $169 for Sigma SA-L mount and $249 for Canon EF-L mount. The company said the lower price reflects the company's appreciation for its loyal Sigma camera users. B&H is accepting pre-orders for the Sigma version and the Canon version now. RONKONKOMA, N.Y. -- Sigma Corp. of America has announced pricing and availability for the new Sigma Mount Converter MC-21, offering photographers a wider range of lens options for L-Mount cameras from Sigma, Leica and Panasonic. The Sigma MC-21 will start shipping in April and will be priced at $169 for Sigma SA-L mount and $249 for Canon EF-L mount. 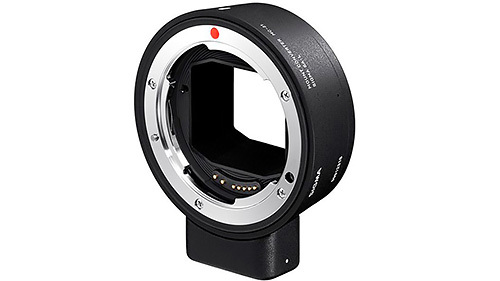 The Sigma Mount Converter MC-21 allows for Sigma's SA mount and Canon EF mount lenses to be used on L-Mount camera bodies. By attaching MC-21 to a Sigma SA mount or Sigma Canon EF mount lens, it becomes compatible with the L-Mount camera system without compromising usability and image quality. The development of Sigma MC-21 increases the number of interchangeable lenses manufactured by Sigma to be used with the L-Mount systems by 29, offering a total of 40 lens choices, including 11 DG Art primes with native L-mount. The addition of MC-21 to the Sigma accessory lineup will increase the accessibility of the L-Mount system and further Sigma's role in the strategic L-Mount Alliance alongside Leica and Panasonic. The lower price for the Sigma MC-21 in Sigma SA-L mount reflects the company's appreciation for the loyal Sigma camera users as the MC-21 in Sigma SA-L mount allows for Sigma SA mount lenses to be used on any L-Mount camera body. Eventually, Sigma will aim to replace its SA mount lenses with the native L-mount versions, but until then, Foveon shooters can rely on the existing offering of Sigma MC-21 at a lower price point to ease the transition to the new system.